Do you run out of cash before the end of the month? Have you tried saving before, but haven’t succeeded? 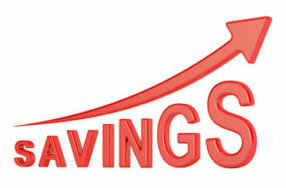 Then it’s time to implement some quick and easy saving tips. As challenging as it may be to save more money, with some effort and self-discipline anyone can at least get started with saving. It’s important that you save something, even if it’s not as much as you would like. Here are a few painless ways to save more money each month. You will pay much less for combined services, then you would if you chose three different companies. If you don’t like to waste time on daily deal websites, I don’t blame you. The advertisements and offers can get quite annoying. But if you’re keen on saving more, then you should at least give these sites a chance. You might actually find some great deals for products and services and manage to save some cash at the end of the month. You will surely spend more money on groceries you don’t even need if you go shopping when you’re upset or hungry. Eat something before you go grocery shopping and always make a list, so you know exactly what you need to buy and avoid distractions. You can make significant savings by simply choosing to commute by public transportation and by reducing electricity use in your home. You can do this by unplugging all devices when not in use, using energy saving light bulbs and energy-efficient appliances, and by settting the thermostat for maximu energy savings. It’s much easier to get carried away with your spending when you don’t have a budget. Establish a monthly budget and reduce unnecessary expenses, such as unused subscriptions, expensive restaurant meals, and fancy morning lattes. You can still enjoy life if you spend less. How to ‘intercept’ big company news – BEFORE it hits the headlines!Forget earnings reports, technical trends and economic data. The ONLY thing that always makes stocks go shooting up is a big news story. Well, as unbelievable as this sounds, here’s a simple way you could cash in on the city’s biggest news stories weeks – sometimes months – before they appear in any mainstream newspaper.